Judge Dredd, the legendary Mega-City One lawman from the pages of 2000 AD, bursts onto iPads and iPhones today as Tin Man Games announces the release of Judge Dredd: Countdown Sector 106. Using The Gamebook Adventures Engine, Countdown Sector 106 is an interactive story where the reader plays Judge Dredd himself, having the ability to choose the direction of the narrative by making decisions on each page. 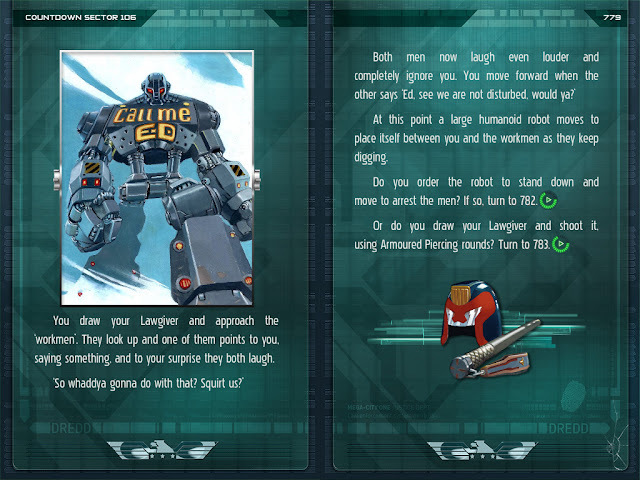 Judge Dredd: Countdown Sector 106 includes all of the features that have become standard in the Gamebook Adventures series such as bookmarking, which act as save points, and an inventory system to keep track of skill stats and information picked up during the patrol. Along with collecting artwork and achievements, readers can now also acquire ‘perp rap sheets’, containing mugshots and background information on the arrested individuals. Judge Dredd: Countdown Sector 106 is available now to download from the App Store.